Looking for a new appetizer or snack recipe to make? If so, we've got one for you today that's courtesy of PastaFits.org. This recipe will make approximately 8 servings. This simple antipasto with fresh flavours is so easy to assemble. It makes the perfect party appetizer or a satisfying any-time snack. 1. Cook tortellini according to package directions. Drain well; let cool completely. 2. 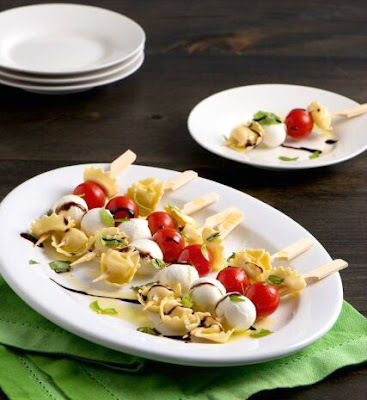 Thread 1 tortellini, bocconcini, basil leaf, tomato, olive and another tortellini on each skewer. Repeat to make 16 skewers. Arrange on serving platter. 3. Whisk together balsamic vinegar, oil, salt and pepper; drizzle over skewers.